Not only is the full moon and excellent time to charge crystals (and yourself!) in the moonlight, it is also a great time to perform a burning bowl ceremony! This is a time to rid yourself of those things you are willing to give up once and for all. If you are truly motivated, then read on! This month the full moon is exact on Monday, Sept. 8 at 6 38 PM Pacific, 9 38 PM eastern time. The Native Americans called this moon the Full Corn Moon. 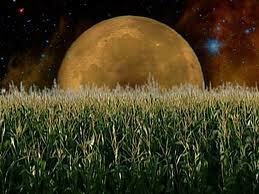 This full Moon corresponds with the time of harvesting corn. It is also called the Barley Moon, because it is the time to harvest and thresh the ripened barley. The Harvest Moon is the full Moon nearest the autumnal equinox, which can occur in September or October and is bright enough to allow finishing all the harvest chores. This full moon will be in the sign Aquarius (in Western Sidereal astrology). This is an excellent time to rid yourself of issues involving: Cold aloofness, fear of involvement, erratic or shocking behavior, inflexible opinions, pain or disease of the ankles and claves, circulation, cramps and spasms, varicose veins. Write down what you would like to get rid of on a small piece of paper. Sign and date the paper. Read what you have written aloud. Light the paper and place it in the heatproof container. Visualize your “problem” going up in smoke! If you wish you may call upon Archangel Uriel and the angels of the full moon to be present and assist you. You can also set the scene with the following elements: Air, color-iridescent blue, yellow; herbs, oils, incense -lemon verbena, pine, star anise. Be creative!